Those of you who have been reading my blog will know that I have been worrying away at the concept of a capability map. Initially, as a business strategist, I could not really see the point of these time consuming maps, some of which extend to many pages of A3 sized paper. They seemed to me to be second class organisation charts. Second class because they defined the activities but not who reports to whom. Over time I have understood more about capability maps and have almost arrived at a comfortable relationship with them. I say almost because I am still a little skeptical. So it is in this frame of mind that I am always on the look out for others worrying about the same issue. William Ulrich and Jim Ryhne recently addressed this issue in an article published on the BA Institute website (standing for Business Architecture Institute). In it they critique “business capability architecture”. In other words they are saying that capability maps are more useful if they are integrated with value stream or value chain maps. They give an example of what they unhelpfully call a Value Stream/Capability Cross-mapping Blueprint. I think I would call this a “capability chain” or “capability stream”: the mix between a value chain and a capability map. Its strength is that it lays out the capabilities in the format of a value chain, similar to my idea in my previous post. In fact I first coined the term “capability chain” in a session together with some PA Consultants at Henley Business School. I am still not entirely sure whether laying the process out in this way is any more helpful than the normal ways of laying out value chains or value streams. But I am sure that this puts capability mapping in its proper place – as a tool you use after you have done value chain mapping. 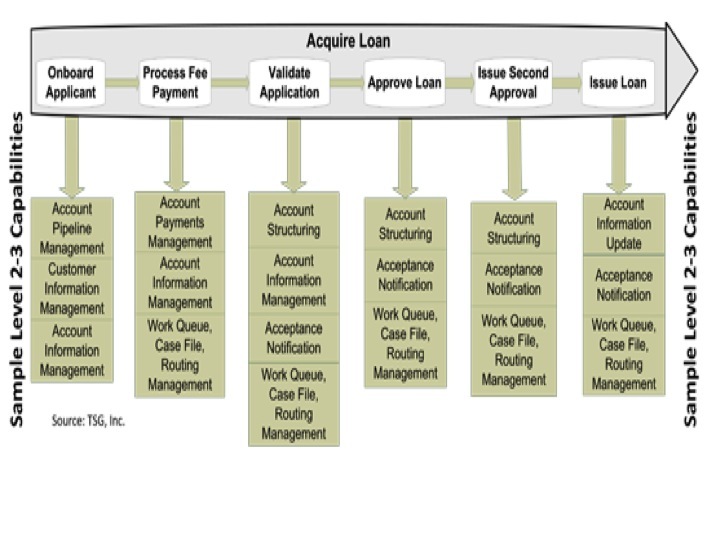 This entry was posted in Capabilities, Value chain. Bookmark the permalink. Hi, this weekend is good. At this moment I am reading this wonderful educational post here at my house.